Holloways of Ludlow designers love to mix and match a wide range of natural and man-made materials in their designs to create beautiful kitchens that exceed expectations. Holloways of Ludlow have no set style, no set ideas and no limits. 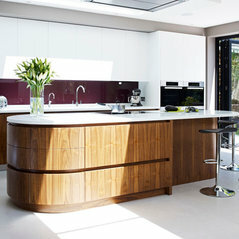 Our designers use whatever materials and manufacturing techniques are required to create their client’s ideal kitchen. Our highly skilled craftsmen regularly incorporate a wide variety of metal finishes, reclaimed materials, stone and coloured glass into their kitchen designs. For example, veneers are used not only on cabinets, but also as splashbacks and stone and similarly, Corian and glass are not only used for worktops but also as door fronts. We even incorporate fabric or wallpaper within a splash back or cabinetry that is covered with a polyester lacquer, that can be easily cleaned to add texture and personality to a kitchen space. 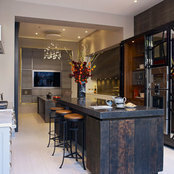 Our expertise in working with reclaimed materials is demonstrated within our bespoke showroom island display in Brook Green - for example, Antique Belgian oak floorboards have been customised in our workshop to create rustic door fronts and is complemented by a fossilised Belgian Bluestone worktop. Holloways of Ludlow are an approved Corian fabricator and showcase in their showroom the synthetic consistency of Glacier White Corian with the natural features of Copper Dune granite, which features sweeping veins usually associated with Marble. The effect is enhanced by the use of the granite as door panels for the wall cabinets. These panels are meticulously arranged so that the features in the Copper Dune flow continuously through the display and neatly interlock with the clean lines in the Corian cabinets. Holloways of Ludlow’s workshop is a particleboard free zone excluding the use of MDF and chipboard. By supplying their cabinet-makers with authentic sheet materials such as plywood they can be safely disposed of in their wood burner, which supplies the heat for the workshop. All our sheet materials are sourced from UK suppliers and are FSC certified. 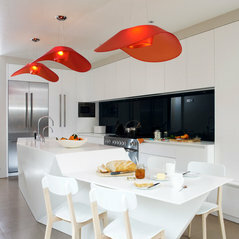 Commented: Where are the orange ceiling lamps from?Hi Khurram, thanks for your question. Unfortunately those particular lights have been discontinued, but we have many other great examples of kitchen lighting on our website.